You are here: Home / Investment / What will you do if you got 4 Crores today? What will you do if you got 4 Crores today? Let us discuss an hypothetical situation where you got 4 crores as cash (all legitimate money) and you have decided to split it equally and put each crore to different uses. In this article I will be explaining the risk vs reward you will get from each of the 4 methods you are planning to deploy your money. People who earn money illegally prefer to have a small part of their money stashed in secret places. They want liquidity and don’t want the money to be accounted for. But there are people (especially old people) who don’t trust banks and governments and prefer to hold all their life saving as cash. Anyway in this hypothetical situation, you have chosen to stash 1 crore as cash in your home. After a few years what will happen to this cash? Liquidity – your money is readily available to you. In any kind of emergency situation you can give use your money for your personal needs. Safety – Safeguarding all your life savings in your locker is risky. You can lose all your money to fire or burglary. You get confirmed negative returns because of inflation. Things get expensive every year. You can buy a nice house in prime area of a city with a few lakhs 30 years back. If you instead kept the few lakhs as cash and decided to buy the same place today, you will be laughed at your face. Demonetisation – The government may suddenly announce all kinds of cash to be not legal tender. Even if it was your own hard earned money, you will be forced to go convert them all into new notes or deposit them into the banks. Recent events has increased this type of risk. This type of investment is quite popular amongst Indians. We are one of the top importers of Gold. There are two kinds of people who put money in Gold. People who buy gold jewellery. These are the guys who are happily living in their own world assuming that they have made a nice investment. But buying jewellery isn’t an investment; its an expense. You waste more money than the gold is worth in terms of wastage and you can’t sell it for today’s price too. People who buy paper gold (through ETFs, Sovereign Gold Bonds, etc) or as gold coins or bars. These can be sold back at the current rate. These can be considered to be a valid investment. You have decided to put in 1 Crore into buying a piece of metal. You are assuming that the price of the gold will go up in the future and you can sell it off later. The only problem with this is, the price of gold will increase/decrease based on the supply/demand of a commodity which has no significant industrial use. The money you have put in doesn’t do any work for you. Money lending is a nice idea. You give money to someone who is in need of it and you earn a small % of it as interest. The interest rate is fixed when you give the money and typically you get payments monthly, quarterly or every year. You don’t even have to go in search of people in need of money. The government and banks do that for you. This is how your bank accounts (both Savings and Fixed deposits) earn you interest. There are debt instruments which are backed by the government like PPF, NSC, RBI Bonds, etc. There are also big companies that need money and issue bonds and would give a nice interest every year. You also get back your entire money after the term ends. On your 1 Crore you would probably earn 7 lakhs per year if deposited in a bank. Certainty of interest. If you have lent it to a trustworthy person/company, you will get your interest on the date it was agreed upon. Convenient. All it takes is a few clicks on your internet banking page to start a fixed deposit. Simple to understand. Calculation of interest earned is easy. 6th grade students know how to calculate simple and compound interest. It will be very hard to beat inflation with interest rate that the government gives. Interest rates will keep moving up/down based on the inflation. So you can never beat inflation with a wide margin. If you decide to give money to someone who is not credit worthy, you risk losing the money. He might just shut shop and declare bankruptcy and say he doesn’t have any money to repay his debts. If the government comes up with new rules which say that you can’t have more than few lakhs in fixed deposit and all remaining money will earn lower interest rate, you are stuck with the lower interest rate. Or the government may say you can’t withdraw your PPF all at once on maturity. Most importantly, even if the company is extremely profitable and earns 100x profits from your money, you will get back only what was agreed upon when you gave the money. Your interest rate is fixed and you can’t earn more than that. Your money is working, but for someone else. Lets say you take the money and start your own business and work hard into building it as a very valuable company. Your customers love your products because of the quality and customer service you provide and you earn a nice profit from it. All the profit you earn is for yourself because you are the owner of the company. Each year you double the money and your value grows exponentially because of the effect of compounding. Your money is working for you and you are reaping all the benefits. Imagine that you could do the same but without ever worrying about what type of company to start or how to build and market the product or handles the sales, etc. You have professionals who do that for you and all you have to do is sit back and relax enjoying your returns. Isn’t this a nice picture? This is the same situation lot of us who have invested in stocks have been enjoying. We have just put in money to buy a share of the company. And we as part-owners of the company have been getting all the profits as dividends and increase in stock price. The money you invest in a really good business has the potential to keep giving you returns every year and it is practically unlimited (as long as it is a good business). As owners you take part in the good and bad of the company. When the company/business does well, you get returns in terms of multiples. It is the only type of legal investment method which is designed to beat inflation. Any decent business needs to make profit more than inflation. And all those profits are reflected in the stock price and dividends you receive as stock holder. Picking the right company isn’t very easy. Lot of time and effort goes into analysing the company’s fundamentals before professionals invest into a business. It is very risky in short term. If you have money which you need in the short term, you should look at other types of investments. You need a good head start. Always the early investors in a company get the most returns. And the company needs to perform well consistently to give good returns. 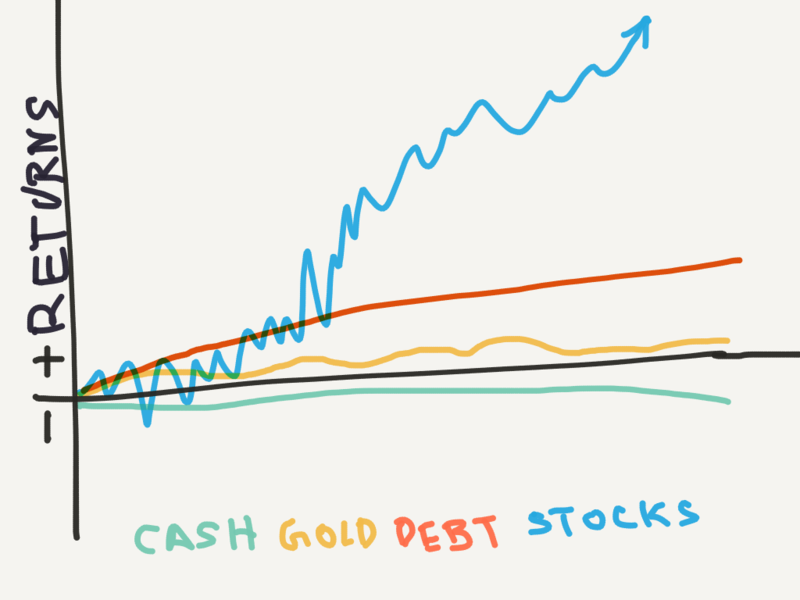 Here is a crude comparison of the four methods of handling money using a non-scientific chart. Now the decision you need to take is whether you want to pile up all your money under your bed or buy shiny metal bars or lend it to someone and make them rich or invest in equity and become owners of businesses? So, what do you want to do with your 4 crores today?